Originally created as Cycle Express in 1990 in San Diego, California, National Powersport Auctions (NPA) now serves lenders and dealers throughout the nation. Offering a complete range of auction-related services was a concept largely unheard of when motorcycle enthusiast Cliff Clifford and the Lomas family began this adventure. "Big changes with the OEMs and the advent of retail financing lead us to where we are today," says NPA founder and now CEO Cliff Clifford. "Bear in mind that I am getting older, but here is my best recollection. If it wasn't for the vision of Kawasaki Motor Corporation (KMC) there is a good chance NPA wouldn't have started when it did... or even exist at all!" Around 1989, KMC announced National Retail Financing with their Good TimesTM Credit Card — this card could be utilized for new purchases and/or services and accessories. Before that, dealers had to source financing on their own, with local banks or small financing institutions, which was a disjointed and cumbersome exercise at best. With the success of KMC gaining market share through its creative financing program, it wasn't long before the other OEMs followed their lead. Dealers suddenly had options to offer customers financing on bikes and accessories. Advertising campaigns promoting easy payment plans started to be mainstream with OEMs supporting market dominance through financing options. NPA's role in moving recovered financed vehicles back into the dealer network followed shortly thereafter, with NPA selling 150 units at its first live dealer-only auction in San Diego in 1991. With growing demands for auction NPA opened their second facility in Atlanta, Georgia in 1997. In addition to expanding its physical facilities, NPA began honing its tools. In 2001, NPA's Auction Management System technology platform was born, followed by the first commercial online powersport auction platform with NPA eSale™ in 2003. "2004 was another turning point," explains NPA COO Jim Woodruff. He notes that is when NPA began actively accepting consignment units from dealers. "It has taken time to get everyone up the education curve, but our Dealer Consignment program now plays a key role for both us and the industry." That is also the year NPA expanded again, adding a Dallas facility to its repertoire. And by 2006, NPA initiated the industry's first online dealer exchange with HDDX for Harley-Davidson dealers. The next four years were watershed moments for NPA and the pre-owned market. "I'm not sure if we changed the market single-handedly, but we sure influenced the direction it took," Cliff states. In 2007 the very first NPA "Simulcast" sale took place, quickly followed by the first Simulcast Factory sale for Yamaha Motor Corporation. In 2008, NPA had to expand again, opening the Cincinnati location. 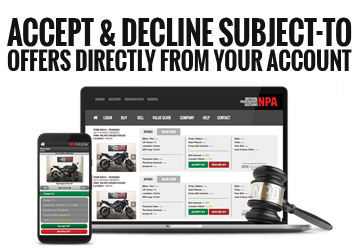 By 2010, NPA was serving all the major powersport finance companies, OEMs and dealers through every live and online auction channel imaginable, selling a record 90,000 units in one year! In order to increase dealer awareness of this paradigm shift, the first auction was held at Dealer Expo in Indianapolis in 2011. "We're not ones to rest on our laurels so we decided to continue raising the bar," explains Cliff of the 2012 launch of NPA Insurance | Total Loss™ exchange and NPA Mobile™ technology for smartphones and tablets. In 2013 NPA expanded NPA Value Guide™ and launched NPA Black Market™ for parts and apparel, as well as new dealer exchanges for Indian Motorcycle, Victory Motorcycles and Penske Automotive Group. After years of researching the industry and exploring facilities, NPA found a new home just north of Philadelphia in Bristol, Pennsylvania. This would make NPA’s fifth location. NPA has always had an eye on the East Coast because of the high population density and strong dealer network. NPA found that there are many top operating dealers in the region, despite the seasonality. This would prove to be true as Philadelphia is already outgrowing the space and looking to move across the street to a bigger warehouse; not even a year after the first auction was held. Today NPA works with all the biggest lenders, Harley-Davidson Financial Services, Synchrony, Honda Remarketing, GE Commercial Distribution Finance, Capital One and Sheffield Financial; a majority of the OEMS, Yamaha, Harley-Davidson, Suzuki, Kawasaki, Polaris, Honda, Ducati; and the nation's largest dealers and dealer groups. "I'm not sure this is what KMC had in mind when they introduced the Good TimesTM Credit Card, but we have been happy to let the good times roll since 1990," concludes Cliff. In June of 2017 NPA was acquired by Copart. "We are thrilled that NPA is now part of the Copart family and believe the team’s expertise will enhance our capabilities," says Copart’s Chief Executive Officer Jay Adair. "NPA is the leader in the powersports auction industry and shares our ownership mindset, commitment to challenging the norm, and focus on delivering results." Cliff adds, "We are very excited about teaming up with Copart. Leveraging Copart’s resources and capabilities with NPA’s industry expertise and market leadership will allow us to kick NPA into high gear. We’re looking forward to taking NPA to a whole new level of growth and success."